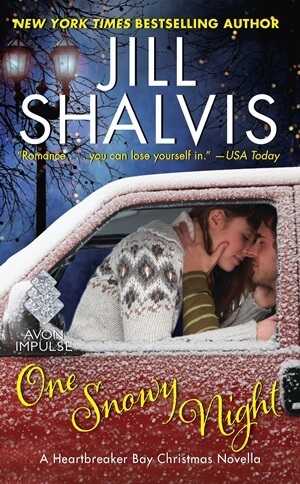 ONE SNOWY NIGHT is super short and sweet and I enjoyed it, but I really wish Ms. Shalvis had gone full length with Max and Rory’s story because there is a lot to these characters that would have benefited from more pages to their story. It’s Christmas Eve and Rory Andrews is finally going back home for the first time since she ran away at seventeen. She is not expecting it to go very well, but desperately needs to show her family that she has changed, in which case sharing a ride with Max Stranton is not a very good idea, particularly because of their history. Max hasn’t forgiven Rory for the role she played in derailing his plans, but sniping at each other the entire trip is going to really get old very fast, so he’s determined to play nice. Besides, she can’t be that bad since she and his dog have a mutual case of adoration for each other and the chemistry between them is so intense. Max and Rory were really likable characters and I like that while confronting the issues from their past was difficult, they did not shy away from doing so and cleared the air between them, with the added benefit being that they could now explore the attraction between them freely. As usual, a Jill Shalvis book isn’t complete without the dog and Carl was a scene-stealer alright. While each book in the Heartbreaker Bay series can read as a stand-alone, I would recommend reading The Trouble with Mistletoe before reading this, for more on Max and Rory’s history. I do have to say that I’m a bit unsatisfied because just when I was settling in for the gist of the story, it was over, but the upside is that we finally get why there was animosity between Max and Rory.